When it comes to wings, it’s all about the sauce baby! It’s the key ingredient to making meat or meat-like dishes, trust us. Tempeh is a blank canvas with little flavour, but once you add the sauce it’s a different story! 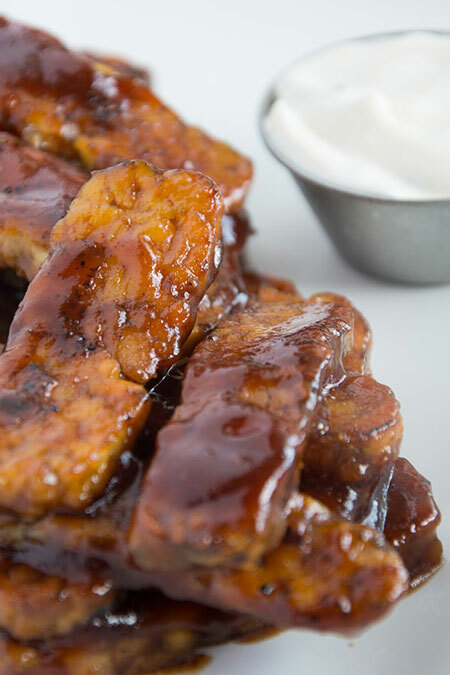 These Tempeh BBQ Wings are the perfect vessel to deliver the tasty sauce right to your mouth! If you haven’t cooked with tempeh before, it’s really easy so don’t worry! We start the Tempeh BBQ Wings by dry rubbing them. This gives them more flavour before baking them in a bath of maple BBQ glory. When choosing your BBQ sauce we recommend something with a smokey flavour, it balances out the sweetness of the maple syrup. But if you’re a sweet BBQ sauce fan you can use that too. This is your creation after all! We highly recommend doubling this recipe if you’re feeling hungry or having friends over, because they are quite tasty and always disappear quickly! These Tempeh BBQ Wings are a mix between a wing and a rib, but no matter how you see them they are delicious! 1/2 cup BBQ Sauce Use your favourite! In a small bowl whisk together the salt, garlic powder, paprika and cayenne powder for the tempeh to create a dry rub. Set aside. 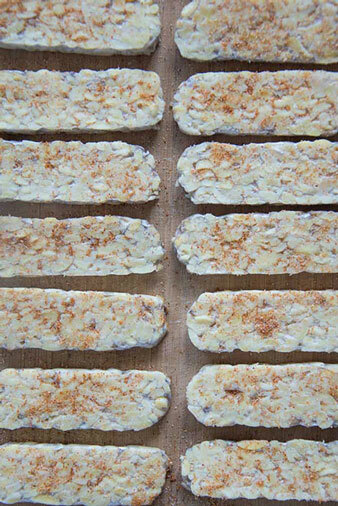 Cut the tempeh into ½ inch thick strips, pat dry and lay on a cutting board. Take the dry rub and rub evenly on to both sides of the tempeh strips. Heat the olive oil up in a frying pan over medium heat and add the tempeh strips. Cook each side of the tempeh for 3-4 minutes until lightly browned and remove from heat. Set the tempeh aside. Line a baking square 8x8 baking dish with tin foil and set aside. In a bowl mix together the BBQ sauce, maple syrup, ketchup, sriracha, garlic powder and onion powder for the sauce. Pour ¼ of the sauce onto the bottom of the lined baking dish. Place tempeh strips into the dish, laying them so they don’t overlap. Pour the remainder of the sauce onto the tempeh and place in the oven, baking for 20 minutes.